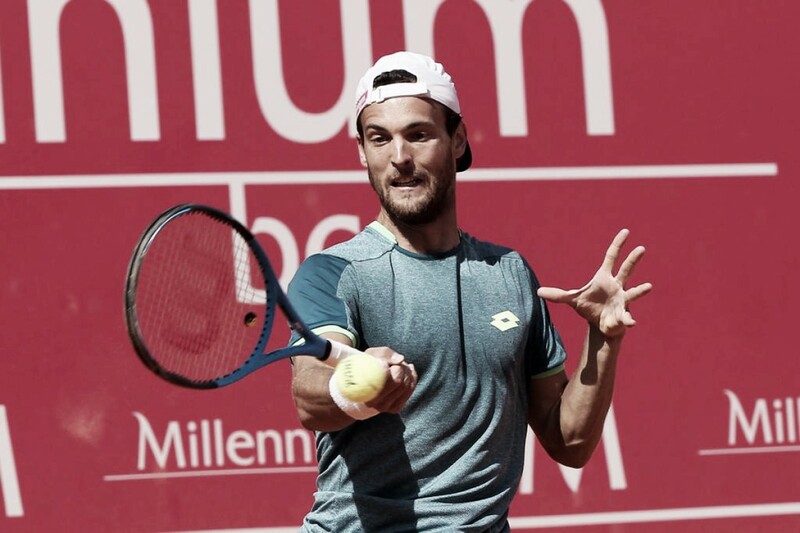 João Sousa, currently ranked 68th on ATP, outlasted Daniil Medvedev, the eighth seed, to book a place in the Millennium Estoril Open second round for the first time in his career. It was a very tight match between Portugal's João Sousa and Daniil Medvedev. In a high-quality match, it was the Portuguese who prevailed in two tough sets. João Sousa started the match on serve and held it with a game at love. He was serving really well and playing a solid tennis. The second game of the match was well disputed and after a 30-30, Daniil Medvedev was able to close it. In the third game, Sousa started to commit some mistakes and that cost him some points and the game. He was broke and the Russian stayed serving at 2-1 up. Although he started with a double fault, the eighth seed held his serve with some arguing from the Portuguese in the middle. Sousa closed the next game with an ace to reduce the disadvantage to 2-3. Until this moment, João had won only 1 point in 5 points he played on the second serve. Sousa was playing a solid tennis as well as Medvedev. After being 0-30 down, the highest ranked player won four consecutive points to hold the serve. In the next game, João held at love being very aggressive and it was time to change the balls. The set seemed one-sided and dominated by the Russian but when Daniil was serving for the set, the Portuguese with the help of the crowd support broke his opponent serve at love to level the match 5-5. He faced one breakpoint next but was able to pass it through and take the leadership of the set by 6-5. Serving to stay in the set, the eighth seed was down 15-30 before taking the game and level the set at 6-6. In this last game the last ball was called out but was on the line, so it was point for the Russian athlete. It was six games all in the first set and all of the results were possible. The two players were playing incredible tennis and making the crowd go crazy. Sousa started the tie-break on serve and confirmed it. After that, Daniil Medvedev won the only point of the tie-break with a great serve. A point which was badly called and had to be repeated was the point which took Sousa, who called the ball good in his opponent favor, to a 2-1 lead in the tie-break. Next, the Portuguese continued winning the points and took the first set 7-6(1), after being down 3-5. The second set started with Daniil Medvedev on serve. He won the first game with a backhand winner. Playing the second game of the set and serving, João Sousa was winning 15- when a ball touched twice on the court. The referee said it was just one time but the Portuguese recognized it was two times and gave the point to the 50th ranked on ATP. After a deuce, Sousa was able to make a backhand winner and winning the game to level the set at one game all. Medvedev was serving to take the lead of the set and at 30-30 he fails a ball at the net to face a breakpoint, but with a good serve, he saved it. João had another chance to break but the formerly ranked 48th was stronger and closed the game with an ace. To try to level the set, Sousa started the game with a winner, which was applauded by his opponent who said "wow" by looking at the ball falling inside of the court lines. It was a well-disputed game but João failed to make it when he hit a backhand which stayed at the net. Daniil Medvedev was on his way to make the 4-1 but the world number 68 broke his serve at love. It was being a difficult time for both of the players to hold their serves as Sousa was broken again to be down 2-4. The crowd was rooting a lot for him and that helped him reach the equality of the score again. From there on, the unseeded player never let his opponent break him again and in some tough games, he got the decisive break to be up 6-5. With a love break, he closed the match. The match ended 7-6(1), 7-5. João Sousa aced Medvedev 2 times and the Russian did the same to his opponent. In 46 points played on Sousa's first serve, he won 34 of them (74%). Daniil Medvedev saved 4 out of 8 breakpoints and double-faulted twice, while Sousa double-faulted once and saved just 2 out of 5 breakpoints. The Portuguese won a total of 85 points against 65 from Medvedev. The match lasted 1 hour and 45 minutes. This was the first time that Sousa won here at the Millennium Estoril Open. Since there is a new tournament, this one, that the Portuguese star didn't win a match in the ATP 250 held in Portugal. When asked about the match, João Sousa is comfortable with his level. "Not a relief but I think this is the year I was better prepared and I have been playing good tennis for the past few months. I was calm, I knew he was a tricky opponent with a specific type of game, a little bit unpredictable, but if I played well and if I was mentally fine I would've many chances to win, and that's how it was. After a first set that went not that well I could remain focused tactically and I was able to play at a good level and that's the most important for me. " João Sousa will now face Pedro Sousa for a place in the quarterfinals, which garantees a Portuguese player in the last eight.